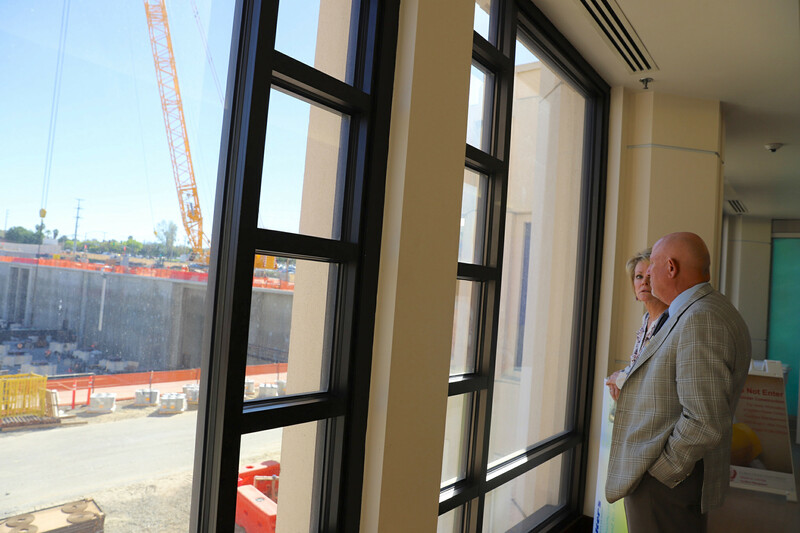 Prior to the check presentation, Steve and Cathy Kienle admired the progress of the construction of the new Children’s Hospital tower from the existing hospital lobby on Wednesday, Feb. 7. Loma Linda University Children’s Hospital (LLUCH) received a special delivery from the Walter’s Children’s Charity Classic committee — a check for $310,000 on Wednesday, February 7. Funds were raised at the 22nd annual Walter’s Children’s Charity Classic (WCCC) on Monday, Oct. 9, 2017. All proceeds will benefit Vision 2020 – The Campaign for a Whole Tomorrow, specifically to name a playroom in the new Children’s Hospital tower. Cumulatively, WCCC has raised over $4 million since 1995. Scott Perryman, senior vice president/administrator for LLUCH, thanked Walter’s Automotive Group for their long-time dedication to children in the Inland Empire. “Walter’s has been a true Champion for Children through their continued commitment to our patients over the past 22 years,” Perryman said. Walter’s Automotive Group is also the presenting sponsor for the 25th Anniversary Reflection Foundation Gala on Thursday, March 1 at the Riverside Convention Center. Photos of the check presentation available here.